I love to sing and act, as long as I don't have to do too much dancing. 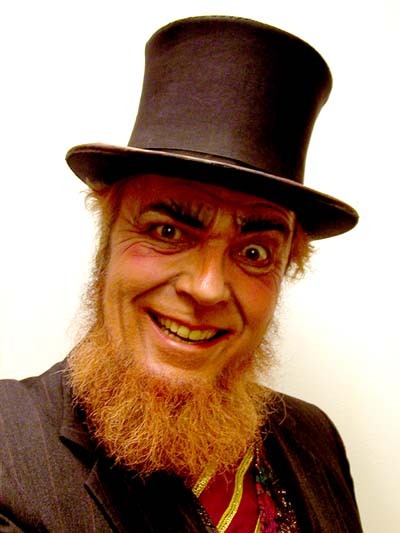 I am a bass-baritone, and a major fan of the operas of Gilbert and Sullivan. I am a late bloomer, only beginning to perform in public in my late 40's. It has been my particular good fortune to be able to share this with my kids, Tova and George. Due to health problems, I'm no longer able to perform on stage, but I still like to sing. I am a regular with the monthly M.I.T. Sea Chantey group, where I get to sing sitting down. In April 2004, I played Preposteros in the M.I.T. Gilbert & Sullivan Players production of Thespis, or The Gods Grown Old. In July 2003 the M.I.T. Gilbert & Sullivan Players put on a semi-staged production of Bizet's Carmen which I was in the chorus of, my first real opera. It was a very fine production, and I was quite proud to be a small part of it. 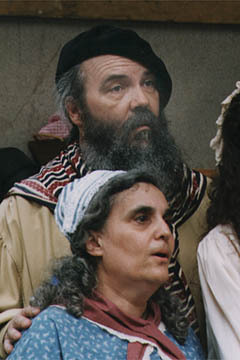 I previously appeared in the Sudbury Savoyards' production of Patience, in February 2003. 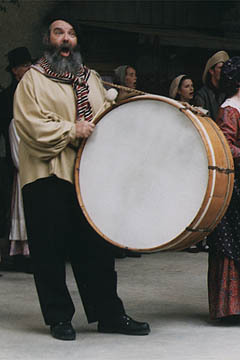 I was in the 2003 Midsummer Revels at the Museum Wharf in South Boston. I played the front of a 4 person dragon in the mummers' play segment, as well as being in the chorus. 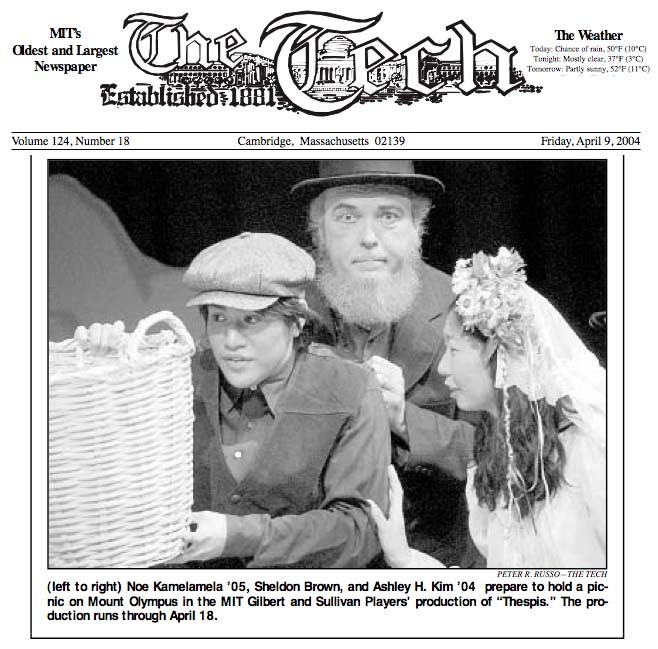 I was also in the 2002 Spring Revels at Sanders Theatre, Harvard University, June 2002. We were pirates in the first act, but then reformed, and became policemen for the second act. See photographs of the show! My wife. Harriet Fell took photographs of the show. November 21,22 & 23, 1996. My son George took photographs of the show. 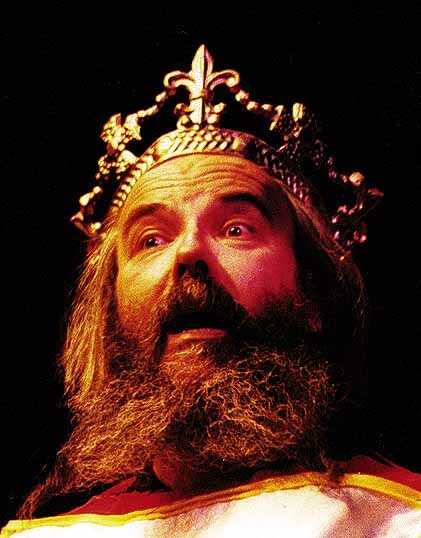 My first starring role, as King Paramount the First, of Utopia, in the M.I.T.Gilbert & Sullivan Players' April 1996 production of Utopia Ltd. I had 2 major solo songs, several smaller solos and recitatives, two duets, a trio and tons of dialogue. I also danced a gavotte, a dance of derision, and attempted the tarantella. Unfortunately, I injured my ankle learning the tarantella, so I had to do a reduced version on stage, with no big air. My daughter Tova played the part of Melene, and did a great job. There were six performances in the M.I.T Student Center: April 12-20, 1996. This was a complete production, with full orchestra. 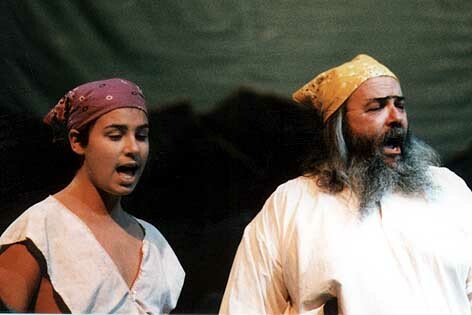 My most recent Revels performance was in the 2002 Spring Revels June 21-23 at Sanders Theatre, Harvard University. I was particularly thrilled to get to share the stage with John Roberts and Tony Barrand, longtime favorites of mine. 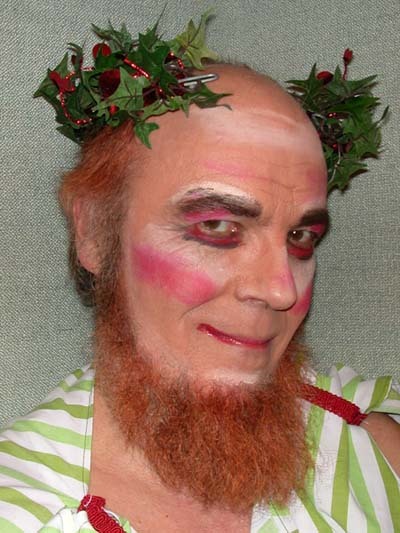 I was previously in the 1997 Midsummer Revels in Lincoln, Massachusetts. 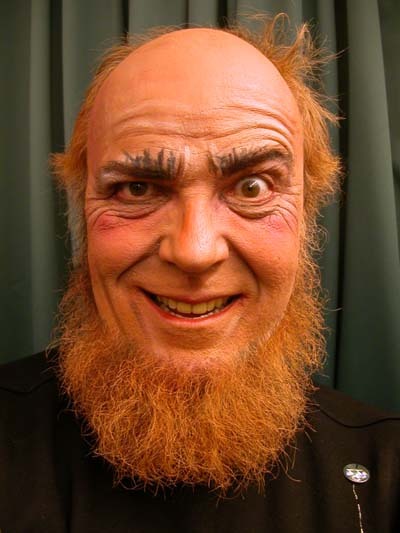 That production had a French-Canadian theme, and production featured noted Québecois soloists Benoit Bourque & Gaston Bernard, as well as the famous Cape Breton fiddler Joe Cormier. You can find more details about this production on the Midsummer Revels Web page. 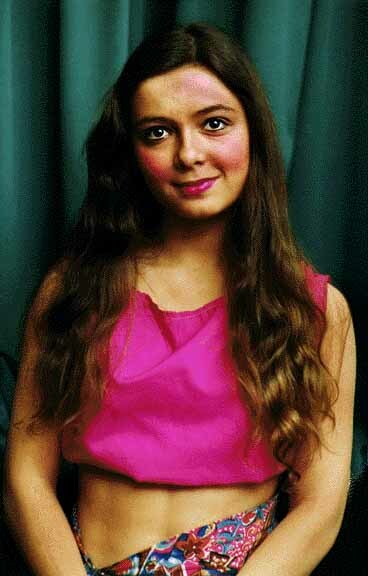 I have also appeared in previous editions of the Midsummer Revels in 1994 and '95. Tova was also in the adult chorus those productions, and in the children's chorus of the 1993 production. My son George joined me in the children's chorus of the '95 Sea Revels. 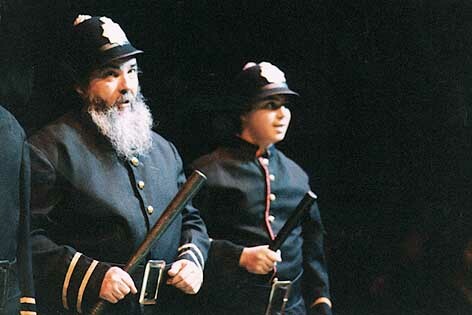 I appeared as The Bailiff, in the 1995 25th anniversary Christmas Revels in Sanders Theatre at Harvard University. I'm the mean Bailiff, choking the Fool (Larry Pisoni). My costume as the man/woman (or "Betty") in the Abbot's Bromley Horn Dance, a sort of Morris Dance with half-a dozen guys dressed up as deer, also a hobby horse, The Fool, and a Boy Archer. This dance is believed to be over a thousand years old. Revels is a bit hard to describe; it is somewhere between a play and a concert, with professional soloists and instrumentalists, and a two volunteer choruses, one of adults, the other of children. The audience also participates, both singing and dancing. The music usually falls into a gray area between the "folk" and "classical" genres. "The Home of Celtic Music on the Internet"
Words to Five thousand folk songs! My kids are(were) members of this children's morris dance team. I am on the board of directors of this outdoor theatre.